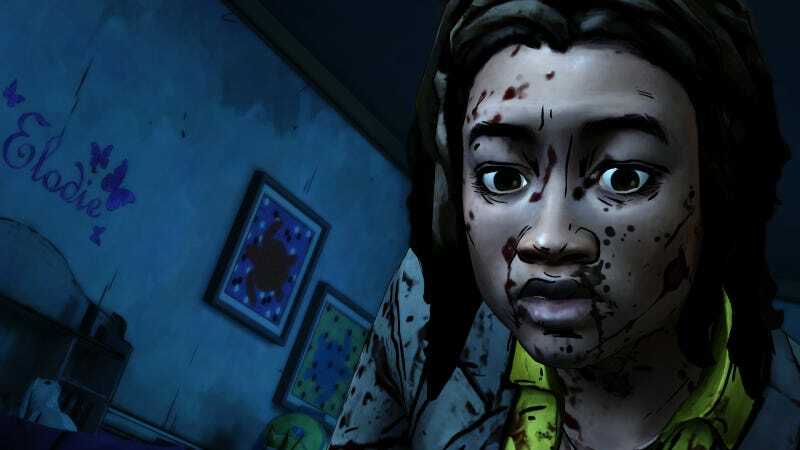 While playing the newest Walking Dead video game miniseries, it’s pretty easy to convince yourself that lead character Michonne will be okay no matter what scenarios unfold. But, she’s not okay and never will be because she’s a parent in a world gone wrong. The Walking Dead is all about up-close horror intruding into people’s most private places. The living rooms, schools and cubicles of past lives offer no comfort in a zombie apocalypse. Revisiting familiar spaces is an awful kind of torture, one that Michonne endures in “Give No Shelter,” the second chapter of her solo side story. As expected, Episode 2 peels a bit more mystery away from the tragic loss that haunts Michonne. Yet, about halfway through, I was all ready to call this installment a wash, concerned as it is with Michonne and company making an escape from their captors. Surely this week’s chunk was just going to be a middle sequence that would suffer from the lack of urgency in the story arc’s front end and the resolution coming with its finale. But then, a flashback started. The memory sequence took me back to the bedroom shared by Michonne’s daughters and quietly churned up acute parental angst. The section in Michonne’s battle-ravaged apartment plays out like a typical Telltale move-and-click experience. You inch toward special items and interact with them to get bread crumbs of narrative or description. It was the specificity of the set dressing that got me worked up here. Scrawled children’s drawings, colorful bedspreads and kid-sized suitcases were strewn about the place, each testifying to the eerie absence of the tiny bodies they belonged to. This scene makes a moment in Episode 1 make sense. I gained a deeper understanding of why Michonne attempted suicide last month: if it were me dealing with that kind of pain, I don’t know if I could go on either. However, as bad as all of that felt, the bigger emotional gut punch was from the interactions that preceded the flashback. After Michonne, seafaring friend Pete and trouble-making young woman Sam make it back to safety, Sam’s family finds out that her brother is dead. Two younger children take the news hard, whimpering and crying when they find out. Hearing voice actors approximate the sobs of children in the wake of such news absolutely gutted me. For me, thinking about kids dealing with grief or emotions that they can’t fathom is even worse than worrying over their physical safety. Grief isn’t like a scrape, chicken pox or a broken bone. For matters of the mind and heart, you can’t rely on the certainty that medicine, rest or biological functions will restore a body’s equilibrium. A parent can try all they want to prepare a child for thinking about oblivion, but it may still be a soul-chilling crucible for a young kid to come to grips with. Last year, when I told my daughter that my mother has been dead for years, she kept asking, “But where is she?” Despite my explanation that her physical body wasn’t around anymore, my five-year-old thought her paternal grandmother still existed somewhere, like an actor waiting in the wings where the audience can’t see. I stammered out something about how the people you love still live in your heart when they die. The conversation petered out without any tears or drama. In the quiet that followed, I knew that the idea was simply too big for her to understand. Even though she’s lived through me squishing bugs and the passing of at least one classroom pet, I know that she doesn’t really get the permanence of death. The other day she shakily tested out her knowledge in the chummy, brash way that kids do. “When you’re dead, you don’t wake up, right?” I told her she was right and bit my lip to counter the ache of all she didn’t know. One day she will know, and it still won’t make any sense. What I worry about most as a parent is the ephemeral stuff. Sure, I freak out internally over her getting hurt, but I am more anxious about the big questions that will eventually come creeping into her life. I’ve already made peace with some of them, but I can’t be sure what works for me will work for her. Hell, the resolutions that work for me aren’t always reliable either. This week marks the 10th anniversary of my mom’s death. Ever since she was born, I’ve told myself that my daughter gets her big kissable cheeks from the grandparent she’ll never meet. I’ve broken down in tears thinking about the fact that my mom will never kiss those cheeks. I’ve had a lot of time to get used to not having a mother anymore. But the ache keeps finding new ways to get in. Whether you’re a parent or a child, no matter how invulnerable or prepared you think you are to the pain of loss, it still holds the power to lay you low. Michonne is a favorite among Walking Dead fans because she presents a cooler, more even temperament than some of the series’ other characters. She’s formidable in combat and seemingly unflappable when crises arise. However, playing through the miniseries focused on her makes it clear that it isn’t any sort of hyper-competency that’s responsible for her personality. The Michonne miniseries shows that its lead character has tried to barricade her emotions away from the rest of the world. But all barricades fall and we must then deal with the world.